It’s July. It’s hot. We all scream for ice cream. I couldn’t talk about Piccadilly and not talk about our other awesome local creamery – Mitchell’s. 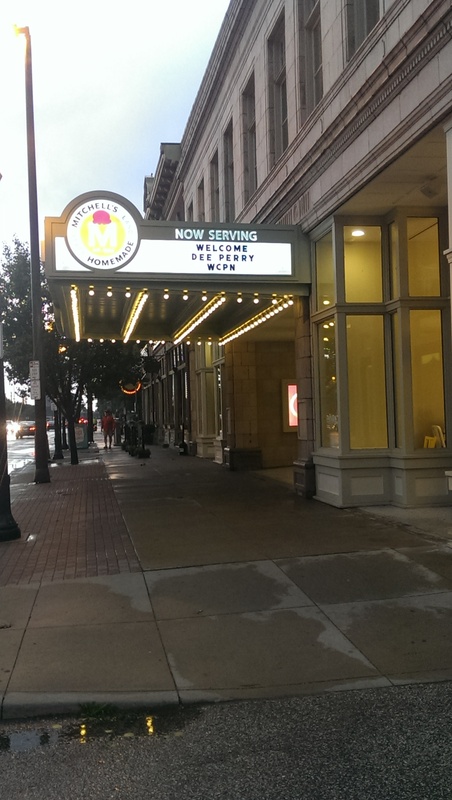 I was recently at a blogging event that was held at Mitchell’s new headquarters on W. 25th. The place is really impressive and a great use of the old Moda building. We gathered in the meeting room on the second floor, which overlooks the production floor. It was very impressive watching them make the ice cream. 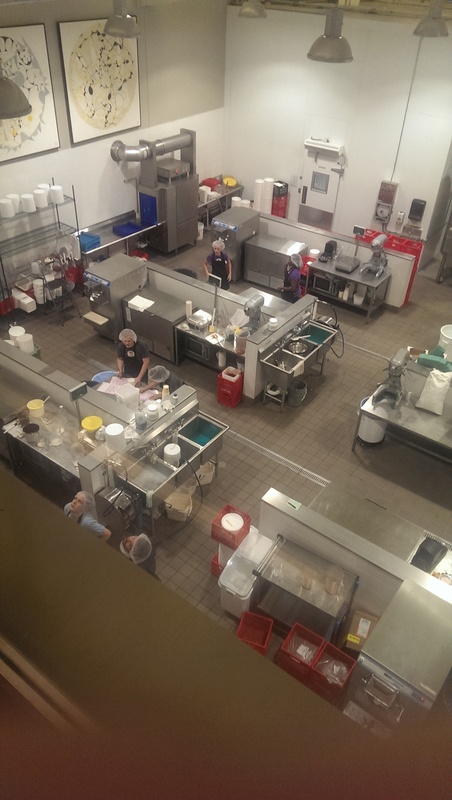 You can see them making the ice cream when you order, but you really get an impressive view from the second floor. Mike Mitchell spoke to us about the quality ingredients they use, explaining they use as many organic and locally sourced ingredients as possible. It’s even Certified Kosher! 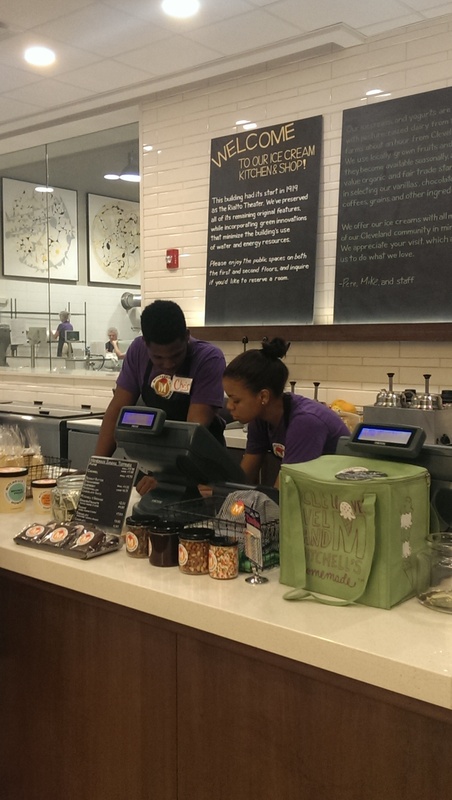 They handcraft the ice creams in small batches, using local grass-fed dairy and fresh seasonal ingredients. He explained he wouldn’t want his family to eat all kinds of pesticides and additives, so he doesn’t want to do that to his customers. That is the kind of thinking I can get behind! Mike and his brother Pete founded the business in 1999. As they explain on their website, “As far back as we can remember, ice cream has been a constant source of happiness to our family. And Cleveland has always been our home. So in 1999 we made crafting top-notch ice creams and serving them to the Cleveland community our life’s work. Today we are as passionate as ever about making our ice creams as delicious and wholesome as they can be, and to being at least a small part of the reason Clevelanders love to call this place home.” Mike is the ice cream chef and Pete is the “taster-in-chief and operations guy.” Now that I have met Mike (I met Pete several years ago when I lived in Solon) I can honestly say that both are just genuinely nice guys. I don’t know about you, but I want to support family-run, locally-operated businesses with friendly and passionate owners as much as possible. Mike even took a moment several times to fist bump one of the toddlers in our little group. Clevelanders are passionate about their ice cream and their favorite ice cream flavors. He told us they try not to take too many flavors off the menu because they get lots of backlash. I have been eating Mitchell’s for years now and have several personal favorites, like the Fresh Mint Chocolate Chunk, Chocolate Peanut Butter Cup, Caramel Sea Salt, and Banana Cream Pie. Another friend swears by their Strawberry. Yet another adores the Butter Pecan. And don’t forget their seasonal flavors, frozen yogurt or sorbets. The Mango sorbet is amazing. When I am going hard-core non-dairy I get the Mango or Raspberry sorbets. They also offer two vegan options made with a coconut milk base. Whatever your favorite, you can’t go wrong. They brought up several flavors for us to try. The Strawberry Jalapeno had a nice kick to it and the Toasted Hazelnut had quite a few fans, but my absolute favorite, which is NOT on the menu at the moment, was the Amaretto-Brown Butter. Yum! 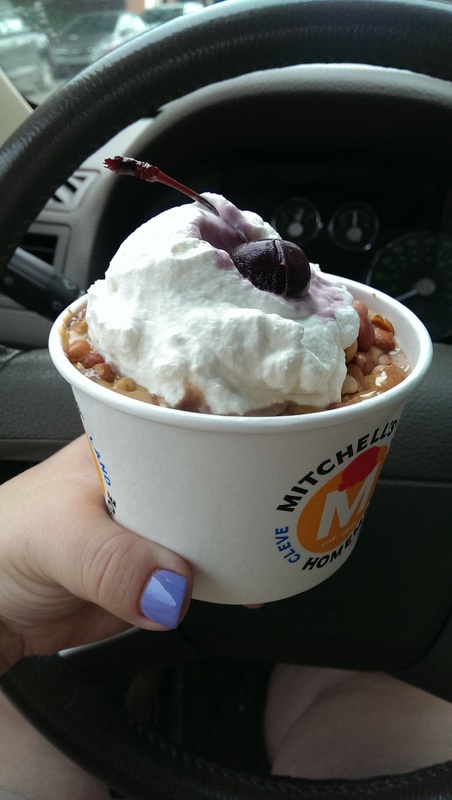 I saved room for my favorite Mitchell’s splurge after the event – the Buckeye Sundae. Made with Peanut Butter Chocolate Chunk ice cream and topped with hot fudge, chocolate shavings, fresh whipped cream and a Bordeaux cherry, it’s a little bit of heaven here in Cleveland, Ohio. And don’t forget to bring a pint home to splurge! You can also find pints in the freezer at local grocery stores. Shops located in Avon, Beachwood, Downtown Cleveland (W. 25th), Rocky River, Solon, Strongsville, Westlake, and Uptown at University Circle.